I have no memory of this ‘zine, but the “Gordon” on the cover likely refers to Robert Gordon, whose neo-rockabilly stylings were briefly (and mysteriously) considered part of the ca.-1977 “punk” rebellion essayed by the other listed artists. 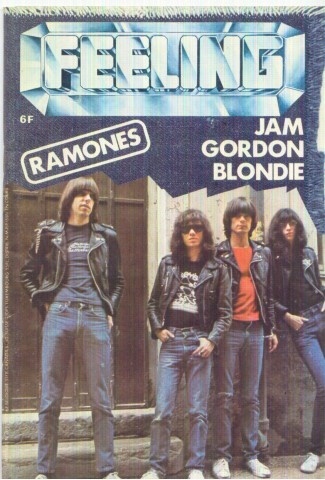 Hadn’t seen this body-lingo photo of the Ramones before. I like the way Johnny is standing on his right and a bit distanced from the rest of the guys, leaving Dee Dee and Joey on his & their left, each placement reflecting that particular Ramone’s workaday political orientation. And different drummer Tommy’s keeping that volatile coalition together, as always. Previous Previous post: Who Wrote the Book?